When I first heard about this book, I knew it was right up my alley. How could I refuse a Cookiepedia? This handy little spiral bound book came and I literally pounced on it, carrying it around with me for days while I read it from cover to cover, then baked a few dozen cookies just to be sure that I would like the recipes. I love them, and I do love the book too. Stacy includes some great touches that would benefit any beginning cookie baker-conversions for butter and chocolate chips in the front cover,as well as oven temperatures, weights, and volumes in the back. Each recipe has some suggestions for alternative ways to make them, there are little tips here and there in the margin, and even space for you to write notes. Also, there's a picture of each and every cookie, which is something I always look for in a cookbook. I'm a visual gal, and I need photos to draw me in. I love the spiral binding so I'm not fighting to keep the book open to the recipe I'm using when I'm baking, too. No matter how good a book is, the real test is the actual food once you make it, right? These chocolate chunk cookies were delicious! Chewy, large hunks of melty chocolate and so easy to make, I can't wait to keep baking my way through the book. Keep reading, because you can actually win yourself a copy, too! Scroll down to the bottom, that is, if you can keep from pausing at the cookie pictures. Pre-heat the oven to 350 F, and line cookie sheets with parchment paper. Sift together the flour, baking soda, and salt into a medium sized bowl. Set aside. In a large bowl with an electric mixer, beat the butter and sugars together until they look light and fluffy. Stop the mixer, scrape down the sides of the bowl, then add in the egg and vanilla. On low speed, mix until they are well combined. Add the flour mixer and combine on low speed just until everything is mixed together, then stop and stir in the chocolate chips/chunks. Spoon out the dough into 1 tbsp sized balls onto the prepared cookie sheets. Leave about 2 inches between them, as they spread quite a lot. Bake for about 10 minutes, then remove the cookies from a pan to a wire rack. Makes about 2 dozen, but I only got 1 1/2 dozen at most. I like my cookies fairly big! These keep well in an airtight container for a few days, if you can resist eating them that long. But, wait! There's more! 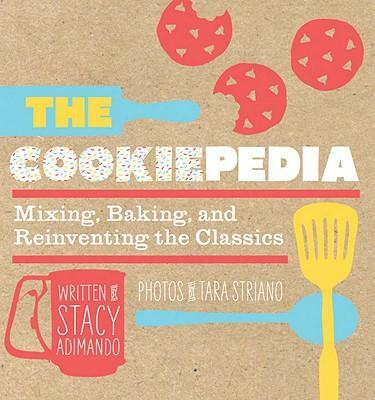 You can get a copy of The Cookie Pedia too! Leave me a comment below telling me what your favorite cookie is. Good luck! I love this book. I'm sure you will too.